"Customer Service At It's Best!" Are you looking to improve the look of your home? Tony's Painting is the perfect choice for all painting needs throughout San Jose, Santa Clara and Los Gatos, CA. Whether it's just one room or your entire house, give the expert painters a call. Don't paint your home for less, paint with the Best! While we are licensed professionals, our painting services remain affordable. Our rates are competitive, our work is of professional quality, our timing is prompt - what more can you ask for? Are you in a rush? No Problem, Tony's Painting is only a call away! Our company will make sure your job receives the quality workmanship it deserves, from start to finish, rush or not! Not only does our company perform house painting services but also exterior power washing, acoustic removal also known as popcorn ceiling removal, wallpaper removal, staining, re-plastering and drywall repairs. When you choose Tony's Painting for your painting needs, we guarantee your 100% satisfaction. Our company will not call a job well done without your approval! Our customers in and around San Jose, Los Gatos and Santa Clara, CA always come first and are treated with utmost respect. That's why our slogan says "Customer Service at its best!" Expect our painter to arrive at your house on time, every time, and ready to begin work! We will always arrive on time, in a clearly marked vehicle. 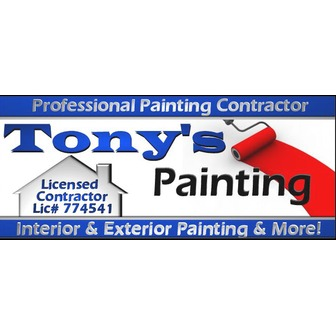 There are many reasons you should choose Tony's Painting for your painting needs! To begin with, Customer's come first. We value each and every one of our customers and their satisfaction with our work is a must! Secondly, when you choose Tony's Painting for your painting project you can expect our company to arrive at your home promptly, and in a clearly marked vehicle. Last but not least, Tony's Painting has over 14 years experience in the trade! Tony is more than qualified to complete your project! When you call Tony our to complete your project your satisfaction is 100% guaranteed! Until your approval is received the project will remain incomplete! Tony's Painting mission is to provide excellent customer service, to satisfy each and every customer, and to provide professional quality workmanship. Call Tony's Painting today for a free consultation and watch your home transform before your eyes with a fresh coat of paint!